What unusual feature do you find in your neighborhood? 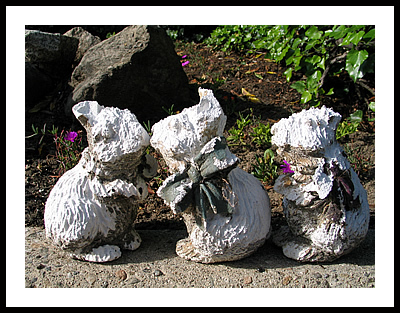 For several years, when I would go on my walk around the neighborhood, I would see these plaster rabbits sitting along the side of the road. No one ever seemed to change their position, but I assumed that someone in my neighborhood has a great sense of humor. Whenever I passed them, I imagined the two of them were having a secret and the other felt left out but didn’t complain. Freudian projection? In any case, the rains kept melting their coats and one day they were gone. Apparently someone felt they were too disreputable for that person’s image of the neighborhood. I was very sorry and wish someone would put another group of animals for everyone to enjoy. Life is too serious not to be taken lightly once in awhile.